Enip., you weren't supposed to tell!!! The worst part is that the 3rd wiccan wench came over a couple days later and I told her I got burned fighting a relatively short dragon. She believed me. Kristy ain't real bright. aaaaand, what size is a relatively short dragon supposed to be? OMG, where are the desktops people. God I love how we just go all over the place here! I feel right at home. 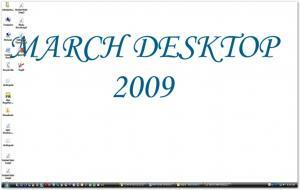 OK Christo, Here's a March 2009 Desktop. Original, don't you think???? Edited by Christopholofigus, 09 March 2009 - 03:44 PM.